Jade Crow is running a gaming shop in Wylde, Idaho, living very quietly. Quiet is good; she's hiding from her ex-lover, the evil sorcerer who killed her family and tried to kill her, to eat her heart and steal her magic. And Wylde is a good place for someone with a magical secret to hide. half the residents are shape-shifters. A sorceress doesn't stand out--at least as long as she doesn't use her magic. If she doesn't use her magic except in minor ways, her enemy may not find her this time. 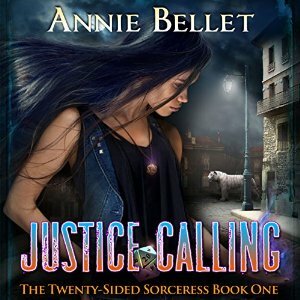 Bu when a shape-shifter enforce, called a Justice, walks into her shop, believing she's about to kill shape-shifters, she has a major problem. Then the leprechaun who owns the antiques & oddities shop next door buys a taxidermied fox who turns out to be the mother of Jade's best friend in Wylde, the problem gets even bigger. To save herself and her friends, she has to help find the perpetrator and stop him. But in the process, she'll use enough magic that her enemy will be able to find her. This novella is the start of the series, and it's all about getting to know the characters and the world. Bellet does a great job of world-building and character development in the little space she's given herself, and the plot moves. Not deep, but a lot of fun.